Jamaica Stock Exchange Limited (JSE), for the first three months ended March 31, 2018 recorded total revenue of $349.58 million, a 45% increase when compared to the $241.07 million booked the prior year. Cess income rose by 84% to $126.06 million relative to $68.56 million the previous year. Fee income grew by 39% to $187.55 million to close the quarter, compared to $134.48 million in 2017. E-campus showed an increase of 21% to $3.24 million, relative to $2.68 million in 2017. Other operating income fell 7% during the period to total $32.73 million compared to $35.35 million in 2017. Total expenses for the year increased by $44.81 million or 28% moving from $161.95 million in 2018 to $206.76 million in 2017. Other operating expenses grew by 57% to $13.27 million from $8.46 million the previous year. Advertising and promotion was up by 5% from $20.57 million in 2017 to $21.61 million. Securities commission fees posted an 92% increase year over year to close at $18.57 million (2016: $9.68 million). Investment income climbed from $5.44 million in 2017 to $8.39 million in 2018. Profit before tax totaled $151 million compared to $84.56 million the prior year’s corresponding period. Tax charges for the quarter totaled $49.69 million (2017: $28.32 million). 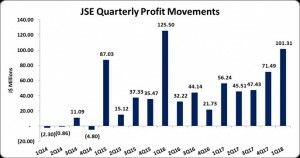 Consequently, JSE reported a net profit for the quarter of $101.31 million compared to a profit of $56.24 million in the prior year, a 80% hike. Total comprehensive income amounted to $97.15 million relative to $59.22 million in 2017. Earnings per share for the quarter totaled $0.14 compared to $0.08 in 2017. The trailing EPS is $0.38. The numbers of shares used in the calculations are 701,250,000.00 units. JSE stock price closed the trading period on May 14, 2018 at $7.00. As at March 31, 2018, assets totaled $1.38 billion, a 21% increase when compared with its balance of $1.14 billion a year prior. The increase was due to a 78% increase in ‘Trade and Other Receivables’ from $170.34 million to $303 million. ‘Government Securities Purchased Under Resales Agreements’ amounted to $208.57 million (2017:$105.80 million) and also contributed to the rise in total assets. Shareholders’ Equity amounted to $1.04 billion (2017: $867.31 million), resulting in a book value per share of $1.48 (2017: $1.24).